In our consulting work, we come across many instances of “TLAR engineering”, ie using “that looks about right” principles to make simple engineering decisions in the field. And a particularly common TLAR practice when faced with structural failures is “if it broke, add more metal”. With a little bit of engineering common sense, this often works well enough (even if not necessarily the most effective or efficient use of time and materials). But there are times where it might not be a great approach, and in some cases, actually make matters worse. 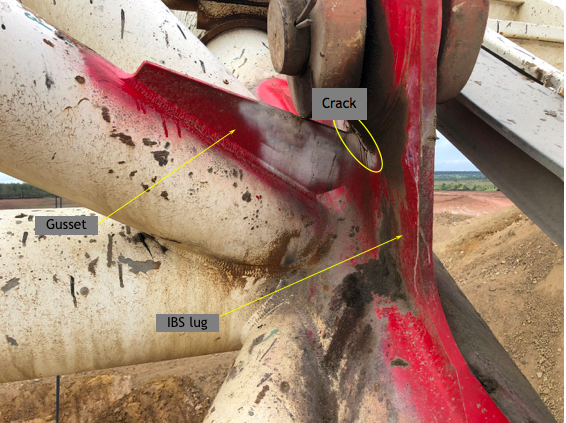 A client recently came to us with an issue of cracking on IBS lugs on a 1370W dragline. 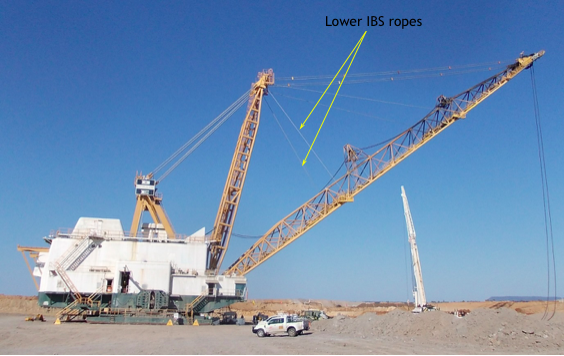 For those not familiar with draglines, IBS refers to the “intermediate boom suspension” and consists of ropes which support the boom at the front of the dragline. 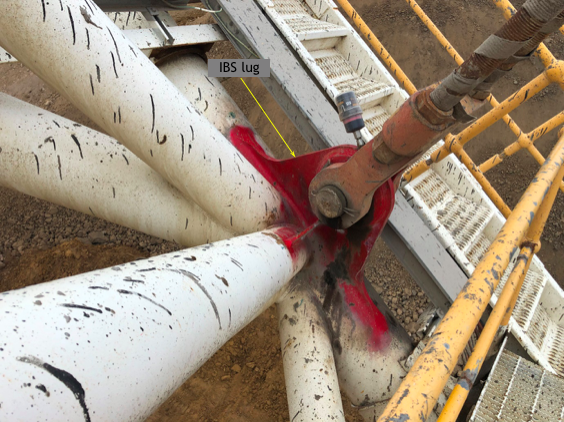 The IBS lugs are metal plates which anchor the IBS ropes to the boom, and are welded to the main structural members on either side of the boom. This particular dragline had experienced repeated cracking in the lug itself, where an adjacent gusset was attached. As a result, a larger, thicker gusset had been installed however the cracking had reoccurred relatively quickly. An upgraded lug design was available from the manufacturer using thicker plate but installation required a substantial effort and the client wanted to determine if there were alternative approaches to resolve the cracking issues. Years ago, cracking in IBS lugs was somewhat common but through incremental improvements in design and welding techniques, it is now relatively rare. Reports from a previous shutdown indicated the lug on this dragline may have been misaligned when installed. The level of misalignment was apparently small – less than 0.5 degrees. Could this by itself explain the recurring cracking? A simplified finite-element model of the lug and adjacent structural members was prepared. A load equivalent to the static preload in the IBS rope was applied, with the load perfectly aligned with the lug. The resulting stresses were relatively low, and the “hotspots” (ie regions of peak stress) did not occur where cracking had been observed. This was consistent with our expectations. We then applied a lateral force, equivalent to just the sideways component of the IBS preload with the lug misaligned by 0.5 degrees. The results from this were quite dramatic. Despite the lateral force amounting to only a few hundred kilograms, the peak stresses were approximately 70 MPa – and they coincided exactly with the observed cracking locations at the intersection between the IBS lug and gusset. The results from this preliminary analysis provided reasonable evidence that the lug misalignment did indeed play a significant role in the cracking issues. Furthermore, it highlighted that the adjacent gusset provided a very stiff and highly localised reaction to lateral loads. Now that the likely mechanism for the cracking had been identified, the next step was to work out what could be done to address it. The first option was to investigate the upgraded lug design from the manufacturer, featuring a thicker lug plate. Given the nature of the problem (highly localised stresses at the intersection with the gusset) would the thicker lug provide much benefit? We analysed the upgraded design and the results are shown below. The peak stress has been reduced by approximately half. This was a significant improvement but involved replacing the entire lug (which is not a trivial repair). The second option involved adding lateral gussets at the top edge of the existing gusset, with the intent of more uniformly distributing the lateral loads and hence reduce the stress concentration effect. The analysis showed that it did reduce the stresses, albeit not quite as much as the upgraded, thicker lug. It did however have the benefit of being a simple repair which could be performed in-situ. The final option to be investigated involved removing the gusset altogether. This concept was expected to have an immediate benefit since it would eliminate the source of the stress concentration. The gusset did provide lateral support to the lug, and bending stresses at the base of the lug were anticipated to increase as a result of removing the gusset. Hand calculations however indicated this effect to be small, and so we proceeded to undertake a full finite element analysis. The results from the FEA were found to match the predictions of the hand calculations. Stresses in the problem area were reduced to very low levels, and an assessment of the welds at the base of the lug indicated the stresses there remained sufficiently low. On this basis we were satisfied that removal of the gusset would provide a significant improvement in fatigue life and not introduce any unacceptable negative side effects. The outcome for the client was doubly beneficial – not only were the modifications predicted to provide a dramatically improved life compared to other options, it was also significantly less costly to implement. One final question remained – was it safe to continue operating the machine with the existing cracks, or should the machine halt work until repairs were completed? Through a combination of understanding of the likely implications of an IBS lug failure and a fracture mechanics analysis, we were able to provide guidance on this also – but that will be the subject of a future post. An obvious question to ask is why was this gusset included in the original design? Most likely it was intended merely as a means of aligning and supporting the main lug while it is being welded in place. They probably did not perform any analysis of the effects of lug misalignment. But they shouldn’t be judged too harshly for this, bearing in mind these draglines were designed in the early 1970’s, long before computers and even electronic calculators were commonplace, and when slide rules were an engineer’s best friend. That they were able to design draglines which remain in operation to this day (many draglines in Australia and the USA are now approaching 50 years of age) is a testament to their overall engineering prowess. 1. I am not sure, however increase maybe double it, the length of the IBS lug to move the sling hole upward, then you can increase the lug, weld it then if the sling moves then the lug will flex. 2. If you want to remove the gusset then make two, add a new IBS lug cut it through the lug weld it bothe sides then weld two gussets on either side of the frame and weld it, maybe you could split the gussets into two of each weld both then bolt it to allow it to flex. If you were to look at loaders and see the frames, then you can see what the loader and the Draglines are different.